Situated along the picturesque coastal community of historic Old Saybrook, Connecticut, in the hamlet of Saybrook Point, the Saybrook Point Inn & Spa features a collection of 100 elegantly appointed guestrooms, the rejuvenating full-service spa SANNO, and casual fine dining restaurant Fresh Salt. The property also features the historic Three Stories and Tall Tales guesthouses, where each room conveys the story of a famed local resident, including Katharine Hepburn’s mother, who was a leading suffragette. 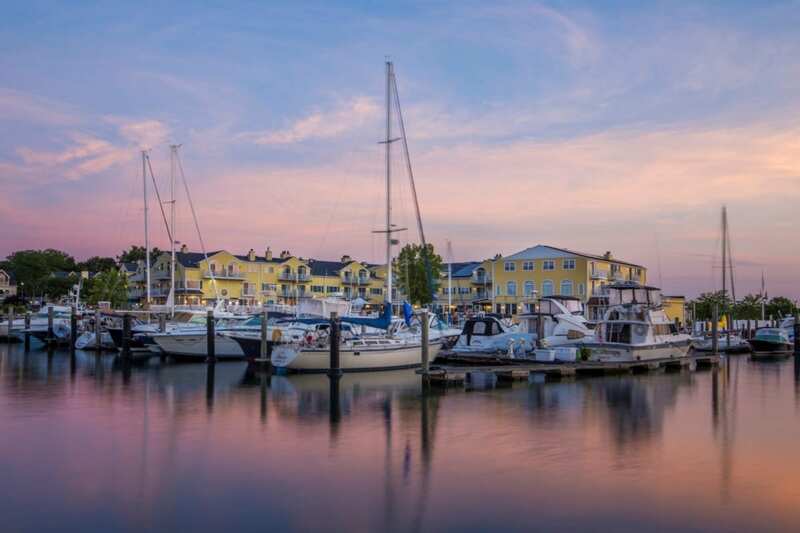 Saybrook Point also shines with the historic Saybrook Point Marina, a landmark yachting dock conveniently located at the mouth of the Connecticut River with easy access to Long Island Sound. It can accommodate vessels from 12 to 200 feet and has received numerous premier Connecticut marina awards. With a collection of 100 exquisite guestrooms featuring iconic views, spacious villas, and two historic guesthouses, Three Stories and Tall Tales, Saybrook Point Inn offers the perfect spot to call home during a visit to this picturesque coastal community of Old Saybrook, Connecticut. Intimate guestrooms feature private balconies and sweeping views of Long Island Sound. Well-appointed villas offer two bedrooms, perfect for that family vacation every August, and Three Stories and Tall Tales, two historic guesthouses with individually designed rooms and common areas for everyone to gather, create lasting memories for the whole family. The main inn offers accommodations ranging in size, view and pricing from standard first floor rooms up to an expanded one bedroom suite. With wrap around porches, private gardens, and common rooms with billiards and books, Three Stories invites guests to unwind and enjoy the peacefulness and tranquility of a completely renovated Italianate home. The historic property features eight individually designed rooms, each with a private balcony, fireplace, fine linens, and original artwork by local artists. Originally built in 1892 as a single-family home for William Vars, the landmark guesthouse reflects the authentic New England character of a region known to value its past. Each guestroom tells a story about a famed local resident, from Katharine Hepburn’s mother who was a co-founder of Planned Parenthood and leading suffragette, to Anna Louise James, who had the distinction of being one of the first women and African American pharmacists in America and ran the James Pharmacy locally. Three Stories is a home for couples, families and friends to reconnect, rejoice and create new memories and experiences. As an intimate retreat or a festive gathering place, it is the perfect setting for future stories and lasting remembrances. Three Stories also includes a luxurious suite and two specially designated meeting spaces. Additional amenities include a first floor living room with fireplace, onsite parking, and stylishly furnished rooms on all three floors with flat-screen televisions, refrigerators with snacks, as well as coffee, espresso and cappuccino machines. In addition, the third floor will feature an outdoor living room setting complete with a fire pit for those cool evening outings. Surrounded by turn-of-the-century antiques and breathtaking views of the Connecticut River and Long Island Sound, Tall Tales invites travelers to bask in the rich traditions of the local area. Each room is uniquely themed after a remarkable individual in early American history, as well as a prominent figure in the community. Subtle design accents such as ornately sculpted lamps and finely textured walls provide an exquisite reminder of a bygone era. This completely refurbished Victorian-era home features six individually designed rooms, each with a private balcony, fireplace, European bedding, fine hand-woven linens, and original artwork. Among the six guestrooms, guests will enjoy a first floor living room and dining area with fireplace, where complimentary breakfast is served daily, and where guests may curl up with a favorite novel. Guests will also revisit classic board games such as chess, checkers and backgammon, as well as play traditional billiards games such as 8-ball, 9-ball or Straight Pool on second floor’s game lounge. Additional amenities include onsite parking and stylishly furnished rooms with private balconies, complimentary wifi, iHome radios, European bedding, fine handwoven linens, handcrafted furniture, original artwork by local artists, flat-screen televisions, refrigerators, and coffee, espresso and cappuccino machines. Saybrook Point is a storied locale in southern New England and coastal Connecticut. Yale was founded here, and Katherine Hepburn lived across the cove in Fenwick. For more than 150 years people have come to Saybrook Point to be on the water. And today, the Point is a national treasure, the only place in the United States where a major river flows into the sea past a small town instead of a port city. For thousands of years, the Point has marked the spot where the great Connecticut River flows into Long Island Sound. The area was home to Algonquin Indians, and then the Pequot, who harvested the rich waters where the river and sound met, and established a thriving culture. In 1623, the Dutch, in a tug of war with the British over land and access to the lucrative fur business that stretched up the river to Quebec, settled in Saybrook Point to establish a permanent colony. The town grew, and by 1700 it was an important enough spot that a group chose it as the place to establish Yale. The college grabbed its books and headed south to New Haven in 1718, but the spot of its founding is still marked, and Saybrook College is the name of one of Yale’s twelve residential colleges, a tip of the hat to the University’s place of birth. Saybrook Point’s convenient location at the mouth of the Connecticut River also made it a center for trade and transfer of goods from riverboats to ocean ships. Ships traveled from the Point to Europe, Africa, and South America. But there was one fortunate problem with the geology of the river, and it’s the reason it is still possible to see where Yale was founded, and to walk past the grave of the first European to be buried in the state, and the reason so many people have flocked to look out over the waters here. There is a shifting sandbar at the mouth of the river, and that sandbar made travel up and down the river hazardous. Other rivers, from the Mississippi to the Hudson and St Lawrence offered surer paths inland and cities sprang up at the point where those, and every other major river in America, and ocean met. The sandbar kept that from happening here, so at some point, Saybrook stopped growing, and today it overlooks the only major river mouth in the United States without a city. In 1998, President Bill Clinton named the Connecticut River one of America’s fourteen Heritage Rivers. The combination of a river that is well cared for, a view that is home to eagles and flocks of migrating birds, where shad still run, and where history is still visible at every turn, make Saybrook Point a place no other.